Posted: Fri Oct 19, 2018 12:16 pm Post subject: Re: I SPOTTED YOU IN ARIZONA!! Spotted Vadergirl on Ina Rd @ Thornydale. She had to do a double take because I was driving my Work Prius! Got a wave AND a chat up. Posted: Sat Oct 20, 2018 11:13 am Post subject: Re: I SPOTTED YOU IN ARIZONA!! Posted: Sun Oct 21, 2018 2:05 pm Post subject: Re: I SPOTTED YOU IN ARIZONA!! Spotted "VADERZZ" at Union Hills & 19th Ave. Good lookin' rig. Posted: Wed Nov 14, 2018 9:36 am Post subject: Re: I SPOTTED YOU IN ARIZONA!! Posted: Tue Jan 29, 2019 10:14 pm Post subject: Re: I SPOTTED YOU IN ARIZONA!! Spotted Homedad today heading eastbound on Dunlap. I wanted to turn around and chase yeah down but had a meeting to get to! Posted: Sun Feb 17, 2019 9:32 pm Post subject: Re: I SPOTTED YOU IN ARIZONA!! Posted: Mon Feb 18, 2019 10:22 am Post subject: Re: I SPOTTED YOU IN ARIZONA!! Spotted Jimbolio and the trailer on Route 66 in Flag on Friday. Jimbo, that was me pointing at you as you crossed 4th street heading east on Route 66. I was on a small motorcycle stopped at the light. Posted: Mon Feb 18, 2019 6:30 pm Post subject: Re: I SPOTTED YOU IN ARIZONA!! Posted: Tue Feb 19, 2019 4:08 pm Post subject: Re: I SPOTTED YOU IN ARIZONA!! Spotted the Blue FJ and White trailer with Jim on Friday in Flag as well. I waved but i was in the pilot headed to Cali. Posted: Tue Feb 19, 2019 8:57 pm Post subject: Re: I SPOTTED YOU IN ARIZONA!! Posted: Tue Feb 19, 2019 10:28 pm Post subject: Re: I SPOTTED YOU IN ARIZONA!! That was me!! Sorry I didn’t see you. Posted: Mon Feb 25, 2019 1:36 pm Post subject: Re: I SPOTTED YOU IN ARIZONA!! I was in my Honda Pilot so I figured as much. 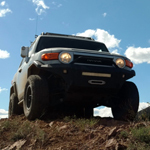 Posted: Wed Mar 06, 2019 11:54 pm Post subject: Re: I SPOTTED YOU IN ARIZONA!! Posted: Sat Mar 09, 2019 11:58 am Post subject: Re: I SPOTTED YOU IN ARIZONA!! Posted: Sat Mar 09, 2019 10:28 pm Post subject: Re: I SPOTTED YOU IN ARIZONA!! 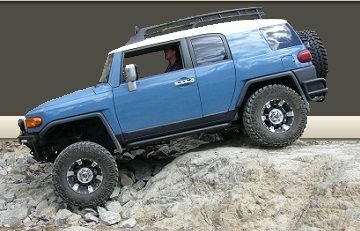 Spotted Overland Bandits silver FJ at Horseshoe Lake Dam earlier today. Didn't have a chance to say hi in person but thanks for the sticker you left on my FJ.